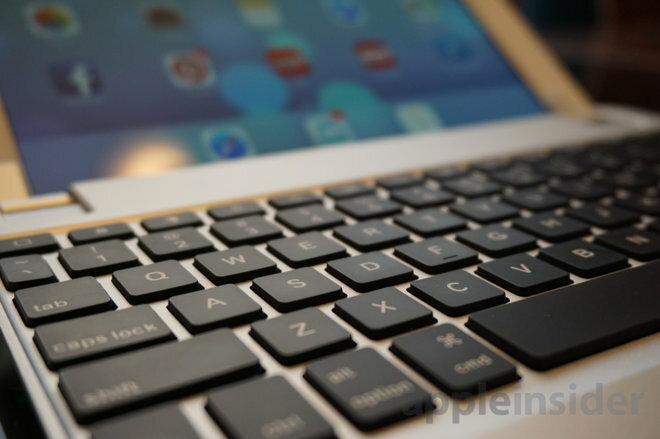 iPad Air 1 & 2 owners looking for a quick and easy way to turn their tablet into a MacBook-style, lap-friendly portable computer need look no further than the new backlit BrydgeAir keyboard —a well-built, well-designed productivity accessory. 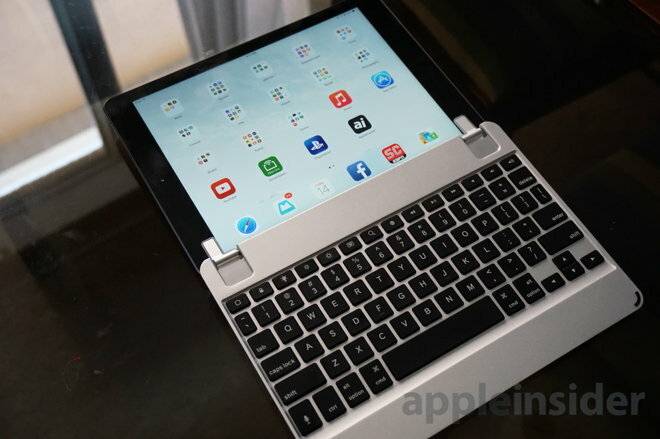 The Brydge for iPad has been around for a few years, but the aluminum unibody Bluetooth accessory has just been given a thinner and lighter redesign intended to complement Apple's iPad Air and new iPad Air 2. The newly launched BrydgeAir comes with the keyboard itself in the box, along with a flat micro USB cable for recharging and simple setup instructions. Retailing for $169, the BrydgeAir includes a full array of keys, including numbers, arrows, and a row of iPad-specific functions including brightness, search, home button, media controls, volume and more. It's also backlit. In addition to including physical keyboard controls, the BrydgeAir also includes a separate Bluetooth radio for enhanced audio. Much like Apple's MacBook Pro, the keyboard's speakers are hidden behind the unit, and project off of the bottom of the iPad when docked. Left: An iPad Air with the BydgeAir. 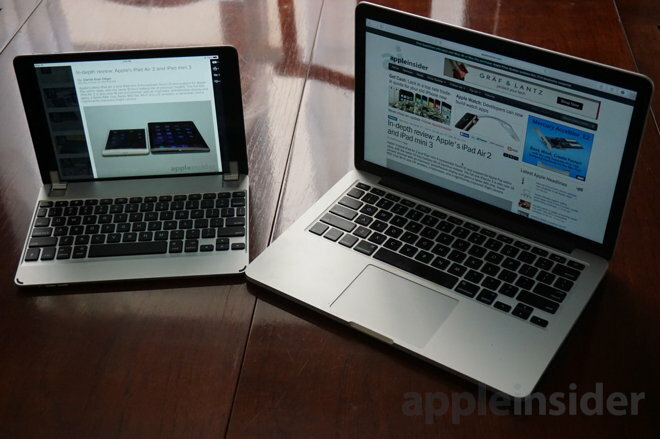 Right: A 13-inch MacBook Pro with Retina display. 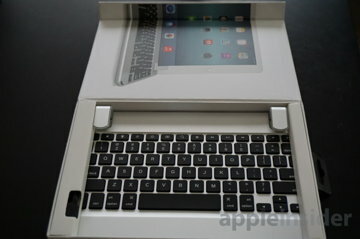 A sample BrydgeAir intended to match Apple's white and aluminum iPad Air 1 and 2 was provided to AppleInsider for review. Another version made for Apple's space gray iPad Air models is also available for $169, while a gold version carries a $20 premium. 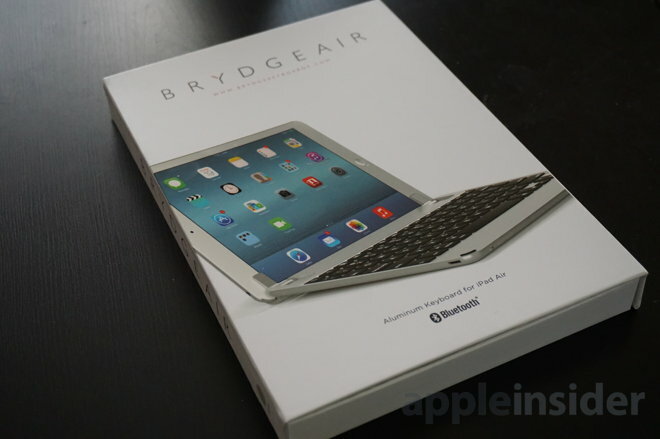 And yes, we typed this entire review on the BrydgeAir with an iPad Air and Apple's Pages word processing application. The design of the BrydgeAir mirrors the iPad Air, in an effort to make the two devices seem as complementary of one another as possible. 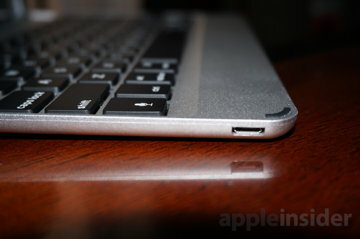 This is especially evident when the iPad is "docked" in the keyboard and closed, clamshell style. Looking at it from the side, the volume buttons and lock switch on the iPad Air rest opposite identical-looking buttons on the keyboard, albeit with very different functions. On the BrydgeAir, the switch controls the power, while two pill-shaped buttons next to it handle Bluetooth pairing of the keyboard and audio components. Top: iPad Air volume buttons and rotation lock. Bottom: BrydgeAir. Bluetooth sync buttons and power switch. And opposite the lock button atop the iPad Air (or on the left side, when docked), the BrydgeAir mirrors this with a similar-sized space for a micro USB port. This attention to detail is a nice touch. The design itself is solid. 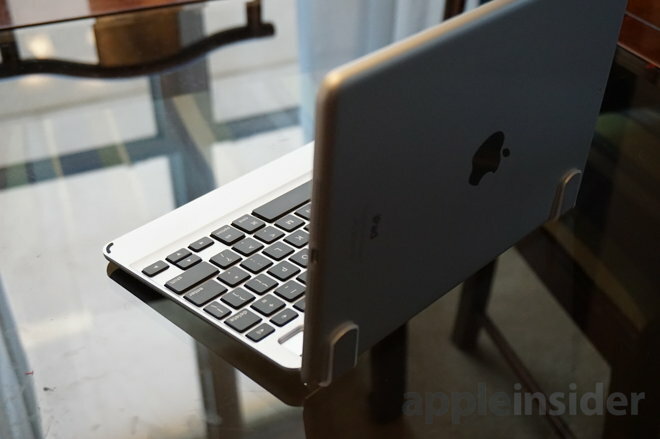 While the keyboard is somewhat heavy at 1.15 pounds —more than doubling the weight of a 1-pound iPad Air on its own —this weight does play a key role in the so-called "lap-ability" of the BrydgeAir, which we'll discuss in the usage portion of this review. Another feature we really enjoy are the hinges on the BrydgeAir. 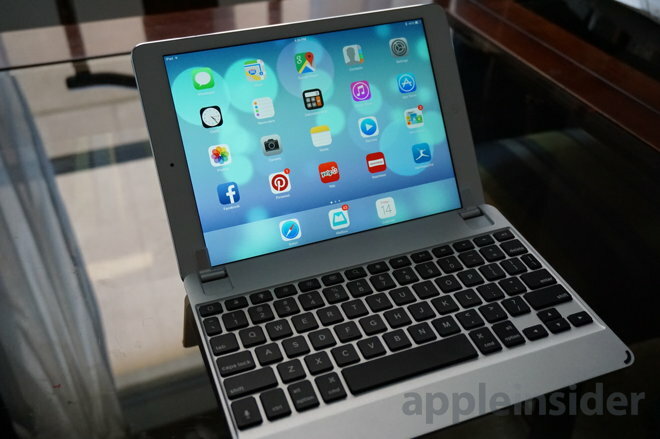 We've never taken to folio-style keyboard accessories, which require the iPad to be housed in a cumbersome protective case in order to offer a laptop-style experience. And some other options on the market connect to the side of the iPad magnetically, like a Smart Cover, but these don't allow the screen to be opened and set at any angle. 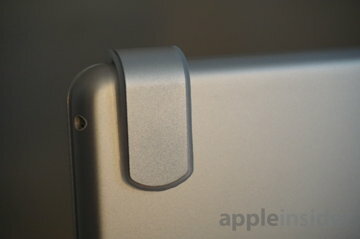 Here, the BrydgeAir excels, allowing users to adjust the iPad to any angle they choose and steadily holding it in place. Again, this feature gives the iPad Air a true notebook-style experience. And because the BrydgeAir doesn't require a special case to hold the iPad, we were table to keep our tablet as Apple intended, light and portable and easily removed from the keyboard in a pinch. The BrydgeAir hinges allow an iPad Air to be displayed securely at a range of 180 degrees. The one issue we did have with the design of the BrydgeAir hinges are the protective rubber stoppers, which appear to be held on by a light adhesive. The first time we attempted to place our iPad in the hinges, we noticed the rubber pushing to the side, exposing the glass of the iPad Air to the aluminum of the hinge and potentially scratching it. We found that inserting our iPad Air at a slight angle, and with a little bit of care, resolved this, and have since grown accustomed to quickly placing and removing the iPad from the BrydgeAir hinges. 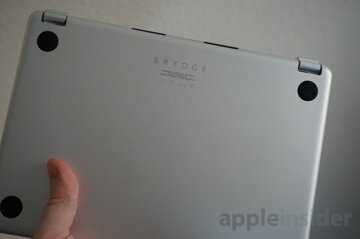 The BrydgeAir does automatically lock and activate the iPad's screen when the clamshell is closed or open. 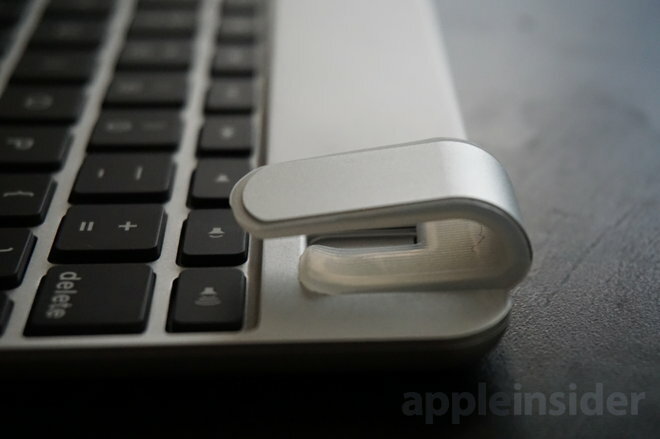 We did find that without a recessed "lip" on the keyboard itself, separating the two magnetically-connected devices is not as easy as it is on an actual MacBook. Instead we learned to wiggle our fingertips into the small space in between the keyboard and iPad in order to separate them. Connecting the BrydgeAir to our iPad Air was simple. After turning it on, we simply held down the dedicated keyboard Bluetooth button to enable pairing mode, which made the device show up as a Bluetooth accessory in the iOS Settings application. Pairing the speakers is a similar process, holding the button located to the right of the keyboard's. Enabling the speakers also plays an audible sound, and giving the speakers their own dedicated button makes it easy for users to turn off the external speakers and conserve battery life. Pairing alerts and other information, like battery life, are cleverly hidden on the right side of the keyboard, underneath the backslash button. When sitting in front of the BrydgeAir, these alerts can be viewed as needed. In all, the design of the BrydgeAir makes it easy to recommend. And in daily usage, our experiences were similarly positive. 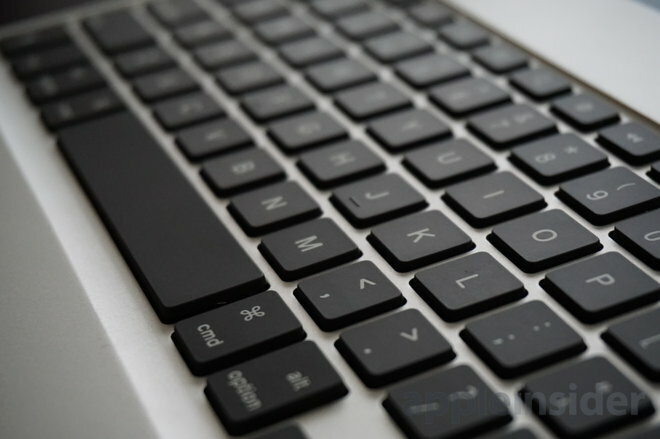 The highest compliment that we can pay the BrydgeAir is every time we used it, we would instinctively put our thumb below the spacebar in search of a TrackPad. The look and feel replicate that of a MacBook-style notebook so well that when typing for extended periods of time, we would forget we were on an iPad. For us, the key to the success of the BrydgeAir design is the aforementioned "lap-ability" of it. That is to say, we could use it on our lap, at any angle, without any concern or frustration. 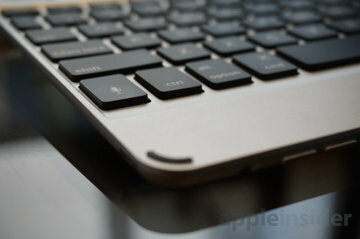 For example, when we tested out Microsoft's Surface 2 last year, the ultra-light flat keyboard that connects to the tablet worked fine on a desk, but attempting to use it on our lap was unmanageable. Thankfully, the BrydgeAir has none of those issues. The base is heavy enough to hold up an iPad Air while resting on your lap, offering a true notebook-style experience that users expect. 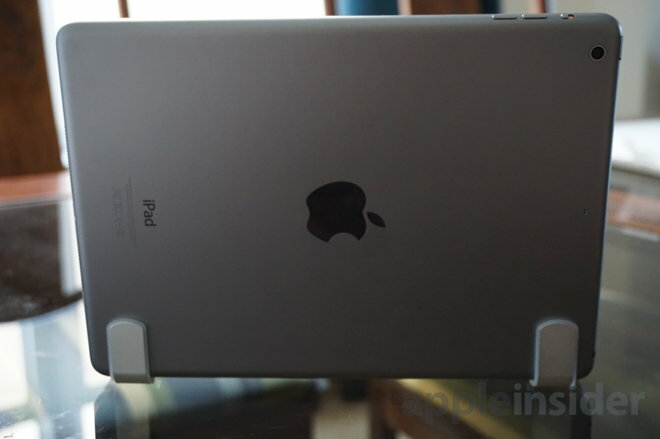 And because the iPad docks without a case, it can be easily removed and maintain its portability. 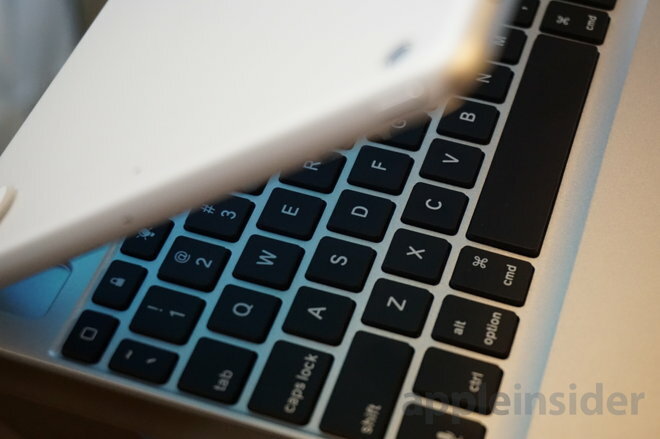 The keys themselves are smaller than on a full-size MacBook, for obvious reason: They must be squeezed into the same size surface area as the iPad Air. While small, we found the keys to be responsive, and typing on the BrydgeAir did not feel overly cramped. The row of iOS-specific commands at the top of the keyboard are also an excellent inclusion. In particular, dedicated buttons for home, brightness, Spotlight search, and volume controls greatly enhanced productivity. 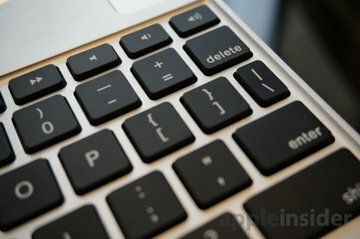 And there's also a dedicated Siri button in the bottom left corner of the keyboard. oard with an iPad knows, arrow buttons make word processing a much more pleasant experience. 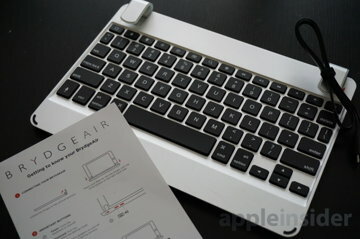 The BrydgeAir also has a dedicated button for the keyboard's backlight function. The white backlight can be set to off or three varying degrees of brightness. The one downside we did find in using the BrydgeAir was its built-in speakers. While pairing of these was easy and convenient, and they did in fact boost volume levels, to our ears the keyboard's internal speakers were too "tinny" for our tastes. 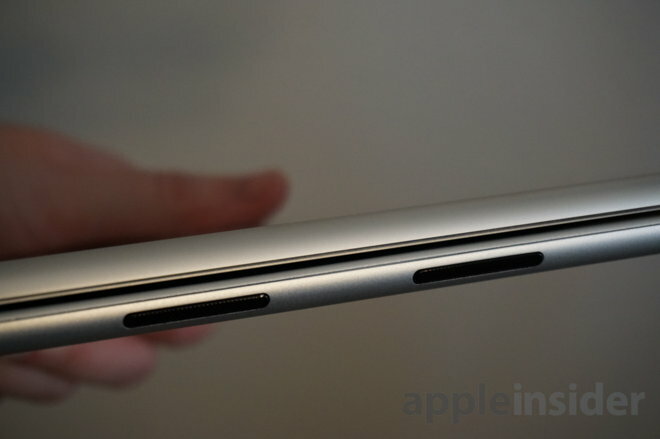 We found that the stereo speakers on the iPad Air actually sounded richer. 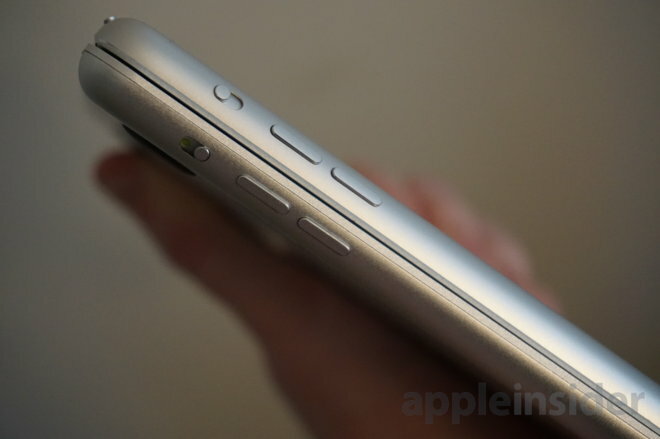 The rear speakers project off the bottom of the iPad Air's bezel. But poor built-in speakers on a portable device are the norm, and anyone looking for improved audio quality should simply use headphones. Just don't buy a BrydgeAir expecting great sound. The BrydgeAir is advertised to offer up to 3 months of usage on a single charge, depending on speakers and backlit keys usage. The huge lineup of keyboard accessories designed for Apple's iPad serves to show how many people are looking for greater productivity on their tablet. But many of the best options out there require an iPad to be stuffed inside a cumbersome case that makes the whole design bulky and heavy. iPad owners who use a protective case on their tablet, or who want the thinnest, lightest or most portable option possible, regardless of lap usage, should look elsewhere. But or those who may want to occasionally use a keyboard with their iPad on the go, laptop-style, but who also plan to frequently use the iPad "naked" in a tablet-only mode, the BrydgeAir is hard to beat. The appealing design and strong construction of the BrydgeAir make it an easy recommendation for any iPad Air or iPad Air 2 owner. The BrydgeAir is available in silver and space gray for $169, while a special gold version runs $189. It's compatible with the new iPad Air 2 and the first iPad Air, and new orders are advertised to arrive before Christmas.